Naturally fermented with delicious Himalayan apples, Apple Cider Vinegar is 100 per cent pure and has the goodness of 'mother' of vinegar, that lends it a cloudy look, but is an affirmation of high quality unprocessed vinegar. 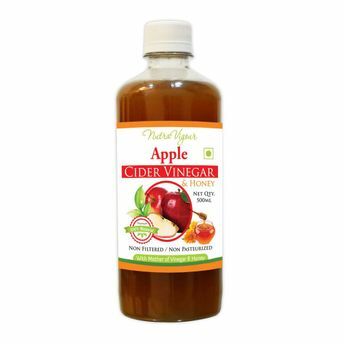 Loaded with potent antioxidants like vitamin C, vitamin E and vitamin A, B-complex vitamins, bi-flavonoids, acetic acid, enzymes, and minerals Apple Cider Vinegar is an elixir of life. Weight Management: Several studies prove that Apple Cider Vinegar along with high carbohydrate meals can increase feeling of fullness that lowers your calorie intake and assists in weight management. Probiotics, the healthy bacteria in Apple Cider Vinegar improve digestion and help in weight management. Improves Digestion: Dilute apple cider vinegar in water, add honey and have it at least thirty minutes prior to a heavy meal to stimulate digestive juices for better breakdown of food. Boosts Energy and Improves Immunity: Raw Apple Cider Vinegar is a general health tonic and helps improve energy and immunity, because of the powerful alkalizing effect it has on your body. A swig of Apple Cider Vinegar diluted in water is just the right potion to flush the toxins out of your system.